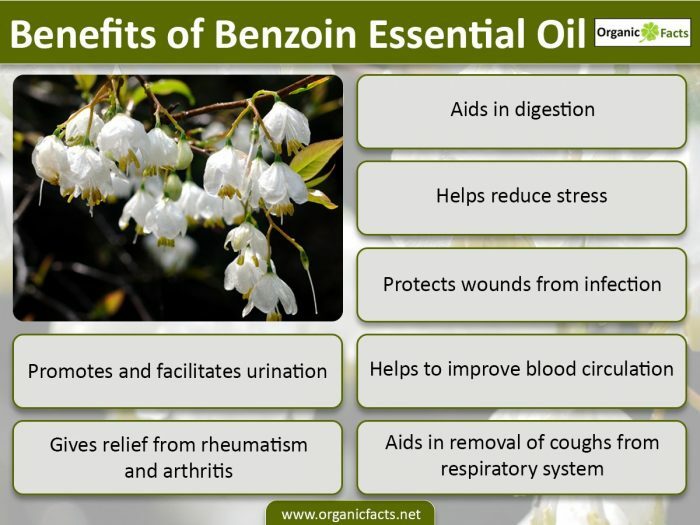 The health benefits of Benzoin essential oil can be attributed to its properties as an antidepressant, carminative, cordial, deodorant, disinfectant, relaxant, diuretic, expectorant, antiseptic, vulnerary, astringent, anti-inflammatory, anti-rheumatic, and a sedative substance. Benzoin oil has been in use for thousands of years. Instances have been found of its use in some of the oldest civilizations of the world, particularly in their religious ceremonies and in their medicines, mainly due to its antidepressant, disinfectant, and aromatic properties. Benzoin essential oil is golden-colored, aromatic, thick, and a resinous oil obtained from the Benzoin tree whose scientific name is Styrax Benzoin. Its chief components are benzyl benzoate, benzoic acid, benzaldehyde, coniferyl benzoate, cinnamic acid, and vanillin. This last component gives it a vanilla-like aroma. Whether or not they were aware of its other medicinal values is a matter of debate, but modern research has found a number of medicinal properties of benzoin oil, some of which are listed below. Benzoin essential oil raises spirit and uplifts mood. That is why it was and still is widely used in religious ceremonies in many parts of the world. It is used in incense sticks and other such substances which, when burnt, gives out smoke with the characteristic aroma of Benzoin oil. The molecules of the components of this oil, along with inhaled smoke, get into our nostrils and are detected by our smell receptors and their effects are transmitted to our brain, thereby stimulating the nervous center. This also gives a warm feeling, stimulates the heartbeat and improves circulation. These properties of Benzoin oil were detected long ago and used to create a mood of celebration in a gathering. Benzoin essential oil, besides being a stimulant and an antidepressant, on one hand, is a relaxant and sedative on the other. It relieves anxiety, tension, nervousness, and stress. Actually, it brings the nervous system and neurotic system to normal. That is why, in case of depression, it gives a feeling of uplifted mood and in case of anxiety and stress, it relaxes people. It also has tranquilizing effects. Thus, it may not be used by students, particularly during exams when they intend to study overnight. It is a very good antiseptic and disinfectant. The components like benzaldehyde, benzoic acid, and benzyl benzoate are very effective germicidal, bactericidal, fungicidal, and antiviral substances. Even the extent to which its smoke spreads on burning makes the zone disinfected from germs. When externally applied to wounds, it prevents sepsis from developing. Benzoin essential oil has carminative and anti-flatulent properties. It helps in the removal of gases from the stomach and the intestines and relieves inflation of the intestines. This is once again due to its relaxing effects. It relaxes the muscular tension in the abdominal area and helps gases pass out. This helps digestion and improves appetite. Being very rich in aroma, it is extensively used as a deodorant for rooms and the body. Its smoke fills the rooms with a nice aroma and drives away odor. Mixed with bathing water and massage oils, or if applied to the body, it kills body odor as well as the germs that cause the odor. In olden days, women in some parts of the world used to smoke their hair with Benzoin essential oil smoke to make it smell good. This property comes from the presence of derivatives of Benzene ring in this oil. Actually, benzene is a cyclic hydrocarbon and like all other cyclic organic compounds are aromatic in nature. These are two of the most used properties of Benzoin oil. It gives very good relief in rheumatism and arthritis when applied externally, due to the easy absorption of benzyl components in it through the skin pores. Due to this, it is used in a number of anti-arthritic balms. Benzoin and its derivatives, despite being highly aromatic, are toxic in nature. Therefore, ingestion or inhalation of excessive quantities can cause nausea, vomiting, headache, and lack of oxygen in the blood so it should be avoided.